Joues Contraste Powder Blush in 69 Fleur de Lotus 5,300 yen ($65.37) , Les 4 Ombres Quadra Eyeshadow in 35 Rives 6,900 yen ($85.10), and the Illusion D’Ombre Long-Wear Luminous Eyeshadow in 87 Riviére. Rives is a warm, neutral palette that offers an array of stunning effortless looks. 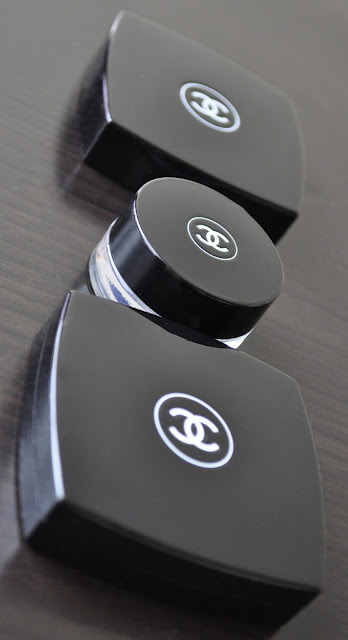 The quality of these eye shadows are immaculate; they had me professing my ongoing love with Chanel to the SA at the counter. To think, I almost passed this Jem up, assuming it would be similar to some of the other Chanel Quadras I have. I'm so glad I didn't listen to myself ( I never do), because Rives is a gorgeous Quadra, and I would highly recommend it to everyone (i.e. Amy...that means you! :P). 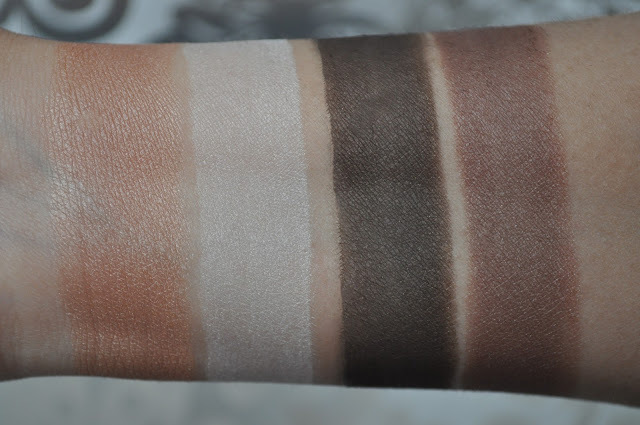 Les 4 Ombres in Rives: A shimmery peach-beige, a pearlized ivory white, a semi-matte dark bark brown with tiny gold shimmers, and a satin plumed mid-toned brown (my favorite shade in the quad). The Illusion D’Ombre in Riviére was just about sold out as soon as it hit the counters. I'm lucky to have been at a Chanel counter the day it was released ( OKAY, so maybe it wasn't luck...just my obsessive-self counting down the days on my beauty calendar, to ensure my person would be first in line at the Chanel counter because I knew this piece was limited edition, and would sell out quickly :D). 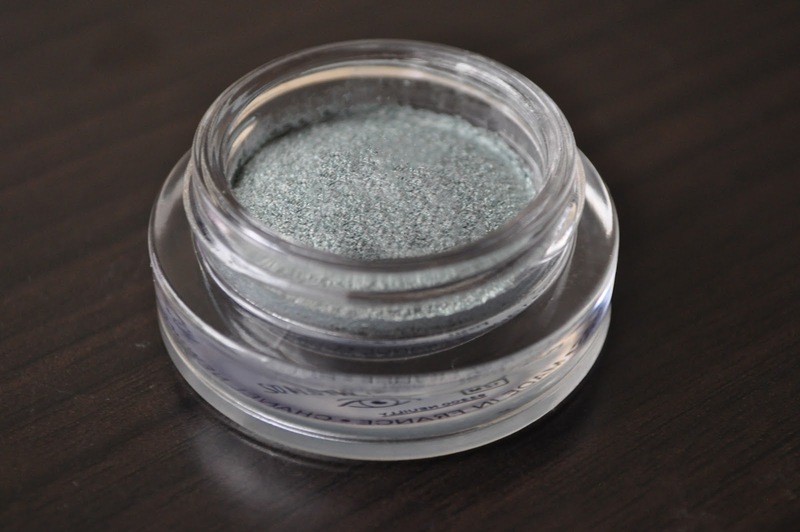 Riviére is a beautiful shade for Spring/Summer. Illusion D' Ombre in Riviere: A glimmering grayed silvery sea-foam green with a golden khaki sheen. 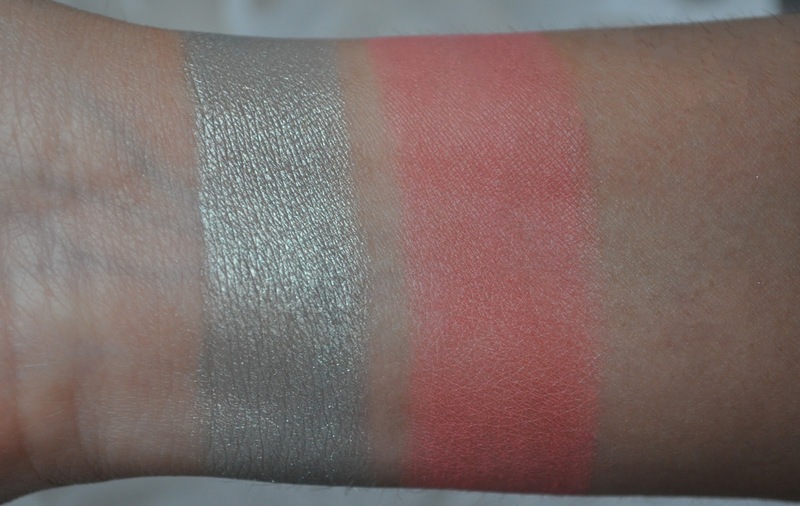 Joues Contraste Powder Blush in Fleur de Lotus: an intense pink coral/coral pink. Chanel Joues Contraste Blush in 69 Fleur de Lotus. Mac Studio Sculpt Concealer in NW20. Laura Mercier Secret Brightenting Powder #1. The peachy-beige all over the lid. The pearlized Ivory white in the inner corner and on the brow bone. 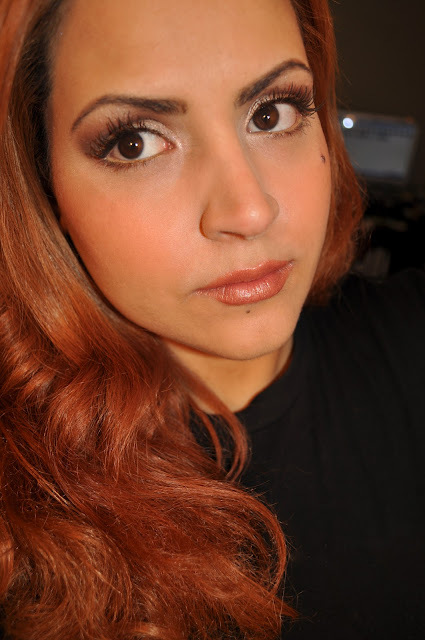 The plumed mid-toned brown in the crease and lower lashline. The dark bark brown in the outer corner. Mac Chromagraphic Pencil in NW25/NC30 used to line the waterline. L'Oreal Voluminous Hydrofuge Mascara in Black Brown. L'Oreal Voluminous Million Lashes Mascara in Black Brown. Chanel Rouge Coco in 107 Patchouli. 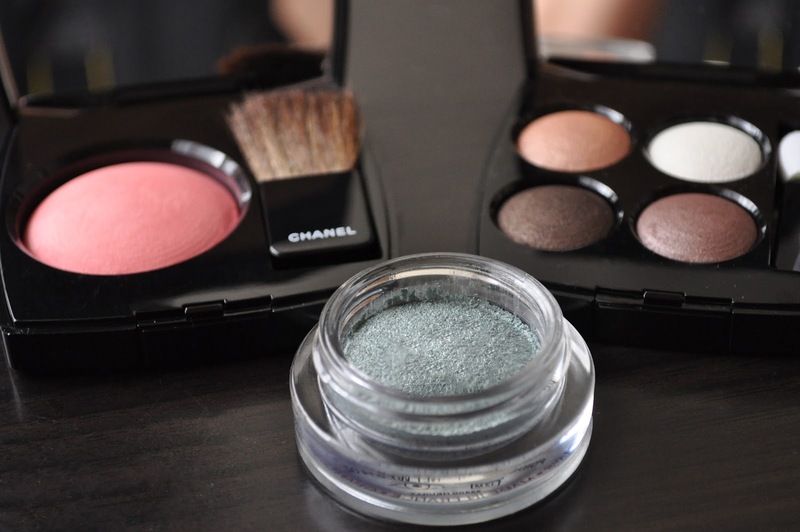 Chanel Les 4 Ombres Quadra Eyeshadow in 35 Rives, I used the peach-beige shadow as a highlight. 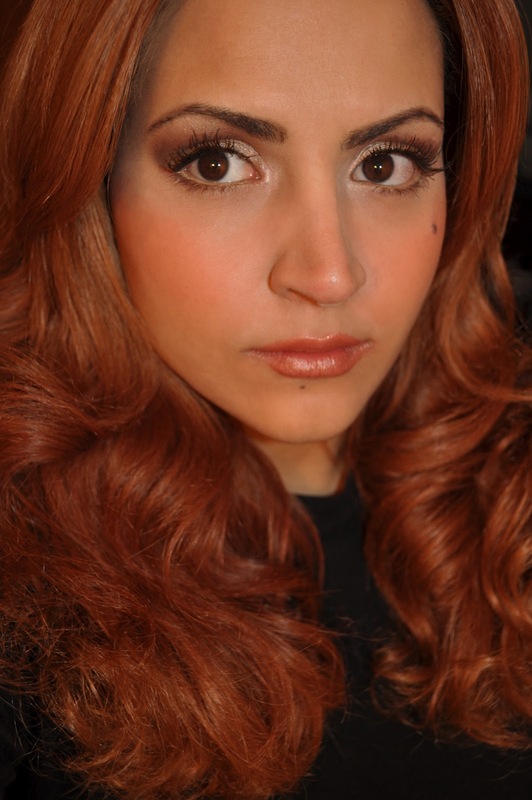 The peachy-beige in the inner corner and on the brow bone. 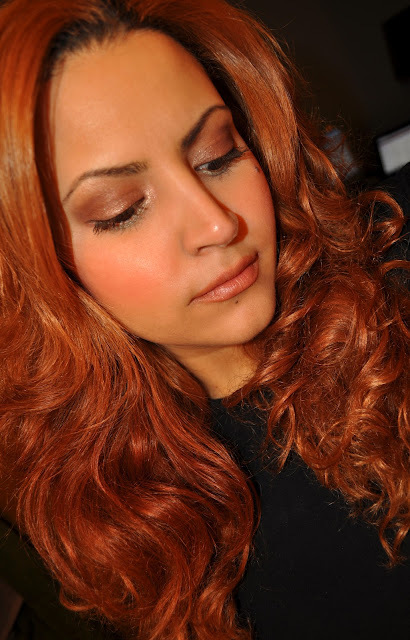 The plumed mid-toned brown all over the lid and blended into the crease and used to line 1/3 of the lower lashline. 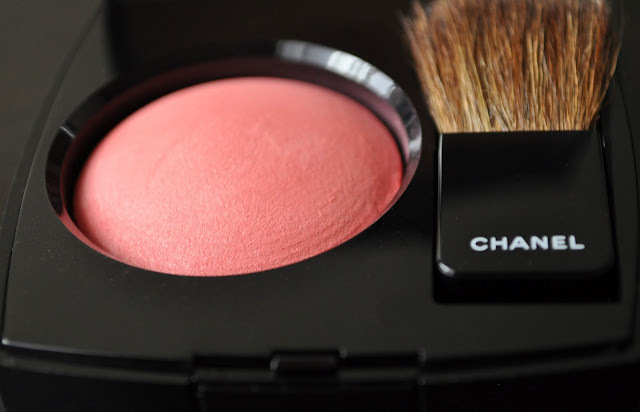 Chanel Illusion D' Ombre in Riviere, along the lower lashline. If you hadn't noticed, I cut my hair, and a lot of it!! Gorgeous items!! that eyeshadow palette is to DIE for!! Thank you for such a lovely compliment, it made my day :D Were you able to check out this blush? I love the blush! It's absolutely gorgeous! It surely is! Keep an eye out this collection will probably be released internationally in the future. Oh yea, fabulous blush for sure!! You look stunning, doll!! That blush really does look beautiful. Looks like it has a light sheen to it, that makes it look really glowing on. It does have a slight sheen. 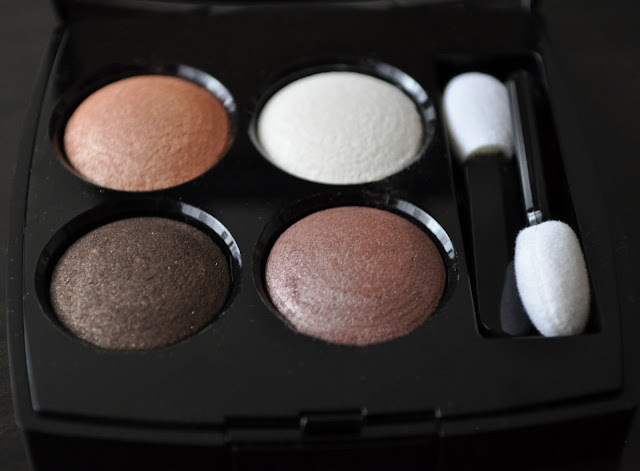 Also, I like pairing Fleur de Lotus with the peachy-beige eyeshadow in the Rives quadra as a highlight. I'm wearing this pairing in the second look. OMG, Love Love your make up look! What's not love, It's Chanel! I was resisting, but now that it's available at Nordstrom I can't say no any longer. Will be checking this Chanel collection today. Great review.